The chefs at Four Seasons Hotel Bahrain Bay have been waiting for the holiday season all year long and now they invite families and friends to kick off the season with festive Thanksgiving dining in CUT by Wolfgang Puck andBahrain Bay Kitchen on November 24 and 25, 2016. 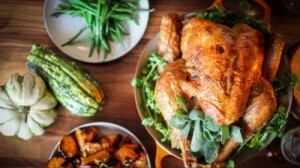 Guests are invited to experience CUT’s unique culinary, service and design combination with a three course Thanksgiving dinner menu on November 24, 2016 and an authentic Thanksgiving Brunch served the next day. The carefully crafted American menu featuring Wolfgang Puck’s favourite festive dishes is prepared by Executive Chef Brian Becher. During the festive dining, guests can also enjoy the regular restaurant menu, showcasing the best selection of prime beef. Three Course Thanksgiving Dinner at CUT by Wolfgang Puck on November 24, 2016 from 7:00 pm onwards is priced at BHD 35, or BHD 45 with beverage pairing. Thanksgiving Brunch at CUT by Wolfgang Puck on November 25, 2016 from 12:30 to 3:30 pm is priced at BHD 29, or BHD 39 or BHD 49 with extended beverage packages. Reservations required: 00973 1711 5044. For those craving for festive buffet dining, the Hotel has turned its regular Friday Brunch into an authentic Thanksgiving feast. Guests are invited to enjoy an exciting atmosphere with live band in the Hotel’s all day dining restaurant Bahrain Bay Kitchen, from 12:30 to 3:30 pm. The Thanksgiving Brunch buffet features a great variety of festive dishes as well as international fare. Divided into five live cooking stations including Arabic, Western, Asian (Chinese and Japanese) and Indian sections, guest can enjoy the outlet’s lively atmosphere while pampering their taste buds with myriad great flavours all carrying the Thanksgiving theme. Thanksgiving Brunch at Bahrain Bay Kitchen on November 25, 2016, from 12:30 to 3:30 pm is priced at BHD 27 including soft beverages, or BHD 37 with an extended beverage package.